Zak and Morganna don’t like homemade cranberry sauce. They like the jellied kind that comes in cans. I despise the weird jiggly stuff that unmolds in the perfect shape of a can, and which must be sliced to be served, and love the homemade stuff with chunks of fruit and maybe nuts. That is the good stuff, at least, in my view. But, I was thinking that maybe I could change their opinion on the cranberry issue by making a sauce that that included ingredients which they loved and craved. I decided that instead of cooking the cranberries in a sugar and water solution, I would cook them with whole spices, red wine, honey and sugar. This gave it all the flavors of a favorite winter beverage around my house–mulled wine. I also added some apples, lightly cooked in apple cider until the cider reduced and jelled, and then after everything cooled, I put in the jewel-like seeds of a whole pomegranate. To give a clean tart finish, I added a squeeze of lime juice and a sprinkle of lime zest as a garnish. The result was a fantastically complex, yet clean-flavored cranberry sauce, full of fruit, spice and aroma, that would make any autumn or winter holiday table proud. The cranberries and apples were soft, and the uncooked pomegranate seeds were crisp, and the vibrant crimson sauce looked lovely with the thin shreds of green lime zest scattered over the surface. What would it go well with, besides roast turkey? 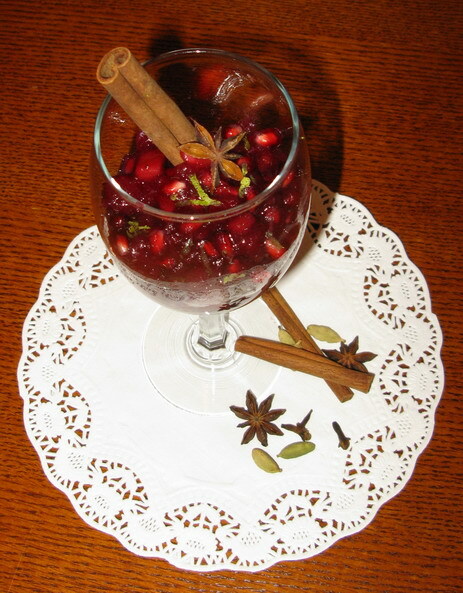 I think it would be delicious with duck or goose–the deeply flavored flesh of the waterfowl would benefit from the brilliant color and flavor of the cranberries and pomegranates. I am also firmly of the opinion that it would be perfect with either lamb or pork as well, particularly the latter. Although lamb with Northern Indian spices would really shine accompanied with this cranberry relish. I am also pretty certain that this sauce would also work as a topping for home made vanilla ice cream or a nice buttery slice of pound cake. Maybe an eggnog-flavored pound cake. Ooh. That does sound good. Besides–it was simple to make. And you can make it a week ahead of time and have it on hand for when you decide to cook a festive roast and hold a celebratory feast at your house. And since we have officially entered the time of feasting, I submit this recipe to you all as something that you can use to perk up your holiday table. Oh, and how did Zak and Morganna like this recipe? Well, they did like it, and they did eat a good bit of it. But they also wiped out a whole can of that horrid jellied stuff, too. 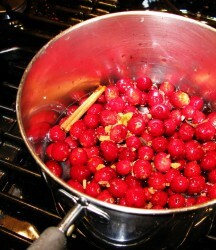 In the same pan as you cooked the cranberries, put the apple and cider, and bring to a boil over medium heat. Turn down the heat and simmer until the apples are soft and the cider begins to jell. Pour this into the pan with the wine and cranberry mixture and mix together thoroughly. Allow to cool to room temperature. Stir in pomegranate seeds and lime juice, then refrigerate until serving time. Just before serving, sprinkle with lime zest. That sounds divine. We were thinking of having duck this year at Christmas, so I think I’ll make some of this to go with it. That looks spectacular! I may have to try it at Christmas. I’ve got a recipe I’m fond of, with shallots and white wine, but this looks like it’s worth archiving the old recipe for! This is like that story you told about making green bean casserole with fresh beans and awesome dried mushrooms and soforth. I’m sure it was delicious, but you know, sometimes that little perverse child inside you wants That Canned Stuff You Grew Up With. O.K. This comment has nothing to do with cranberry sauce. If you have not seen the movie Ratatouille, you must see it. Buy it for Kat, she will love it as she grows through toddlerhood. It’s the perfect movie for growing foodies. I bet Morgana would love it too! Oh, I almost forgot. Thomas Keller was the consultant on Ratatouille, and there’s an interview with him and the main animator on the DVD. I thought it was very inspiring. I’ve always wanted to work with Thomas Keller. I’m almost a luddite in my dislike of processed or canned ingredients and my love of traditional cooking tools (mortar and pestle! ), but I have to admit to a total love for that canned, jiggley cranberry sauce. Oh, I like the fancy stuff too – oranges and nuts and all are nice. But tradition is a fine thing, and I love the horrible old canned stuff. mmmmmmmmm…..
Wow that sounds delicious. I realize the mulling spices are there for the wine, but do you think this would work if you just used the sugar water like normal and left the recipe you provided otherwise untouched? I ask because I would love to make this for my parents, but the wine would scare them off. Otana, Kristi–let me know if you like it when you make it, okay? Elizabeth, Diane, it has nothing to do with the fact that the jellied stuff comes from a can that makes me dislike it–it is the texture. It isn’t quite smooth–it is somewhat grainy, and that is weird. It tastes okay, otherwise. Truth be told, I like the green bean stuff, too, though I prefer it with frozen beans. Roxanne–I adore that film! I preordered it when it first showed up on Amazon, and have already watched it twice. I had so much fun seeing it in the theatre–I recognized the brands of the cookware and stoves, and of course the Dansko shoes–it was a trip. I knew that Keller had consulted on the film before I went to see it, but it was made obvious when Remy did the ratatouille at the end–the presentation was pure Keller. The interview segment is awesome. Morganna and I watched it, enrapt. She is in awe of Keller, now, too, though she is still gushy over Eric Ripert and of course, Anthony Bourdain. I keep meaning to write a post about the movie and keep not getting around to it. Maybe I will write one soon…. Benjamin–you could use pomegranate juice instead of wine. That would be beautifully tasty–tastier than the sugar water. Then just use the spices as you would in the wine. 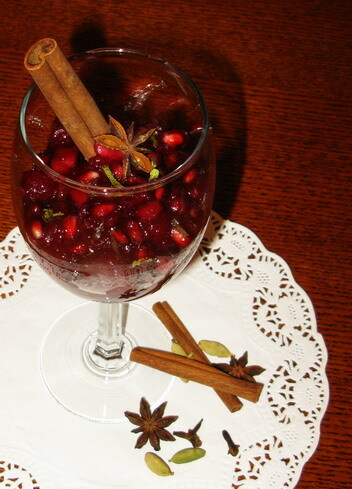 The wine gave the sauce a gorgeous crimson color–the pomegranate juice would do the same. With just the sugar water and cranberries providing color–it wouldn’t be quite so brilliant. I made my cranberry sauce with oranges and ginger. Oh yum…. Elizabeth – there’s a story about a hotel (or other corporate food-providing organization – school lunch provider maybe?) that was tasked with developing a better meatloaf. Meatloaf, as you know, isn’t easy to develop for crowds because everyone has his own prefered version: oatmeal or not, grated onion or not, borvril or tomato paste or none at all, and so on. The research kitchen cooks could be real artists, and they put their artistry into the meatloaf and only good ingredients as well. But whatever they made, it didn’t pass muster with the VP who had to approve it. “There’s something missing,” he said after each tasting, but couldn’t say what. Finally one of the cooks figured it out. She made one more meatloaf and presented it. The VP loved it. What was the missing taste? The tinny aftertaste of canned tomato paste. I hate cranberries…but I think I’ll try your recipe. It sounds good. What would you suggest for someone who doesn’t do wine and (as a impecunious graduate student) can’t face the price of pomegranate juice? You could use all apple cider, or cranapple juice. I don’t like canned cranberry sauce either, but then I didn’t grow up eating it. I think it’s one of those childhood things. Then again, my mother always made delicious homemade macaroni and cheese, but I occasionally catch myself with an unholy lust for the boxed stuff… oh, I have no idea. Between that and the Ramen-packet cravings I think I might have a sodium deficiency. The addiction to canned cranberry sauce is unholy – and unavoidable for some of us. My mom would make chicken patty sandwiches with lettuce, mayo, and a thick slice of cranberry sauce on them. I cannot explain nor defend this behavior, but to this day I crave that combination. We make fancy cranberry concoctions for holidays now (ices and relishes and other delights) – but sometimes I still sneak home a can of the jiggly stuff to satisfy the urge. It’s unwholesome to the extreme. I like either fancy homemade cranberry relish with fresh berries and pecans and orange peel and cinammon, or the jelly jiggly stuff. What I don’t like is the canned “whole cranberry sauce”. The berries in there are all mushy and yuck. I guess I want either crisp fresh cranberries or to have it totally jellified. And pinot noir is probably the best alcoholic beverage I have had so far.